After the opponent on the east front had used the 24th and 25th July to make the life sour for the Princess Irene men. An end to this was made once and for all on the 29th when the 1st R.S. together with the Battalion and the Storm Unit seized the town Mranggen. It was even for the Stoters an event since they had been looking on this place from their old positions at the Slaughterhouse and Veda for so long. If it had been well defended the fortifications on this part of the front should have given us heavy losses: the opponent had build a kind of waterline here, which did not stopped soldiers like our who came from a country with so much water. The seizing went well. Mranggen was nothing more than a big kampong filthy, neglected and deserted. On 27th July the peace in Semarang was disturbed by a bombardment, which killed a few Indonesians. It was probably a Japanese machine, which dropped two bombs and disappeared. The same day the 1st R.S. and the Storm Unit made the first push from Demak to Poerwosari by which the whole front line to the east was moved 4 kilometres and the demilitarised zone of the Republic (read main line of defence) was broken through. With the threat to the east gone it was time to push the opponent out of his positions on the west front. Now it was time for 2-6 R.I. to come into action. 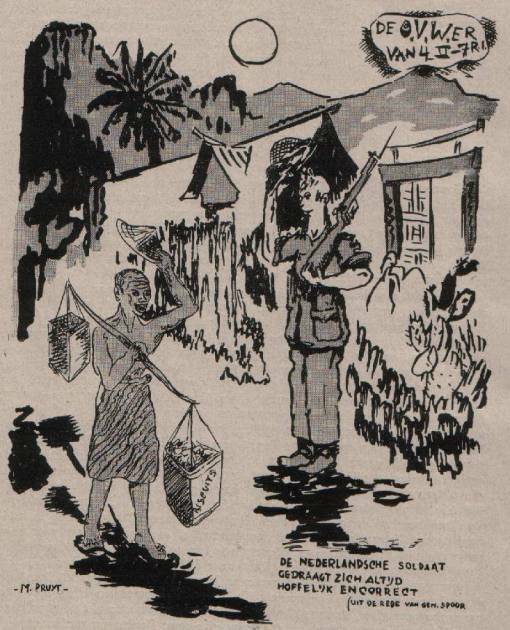 On 29th July Kaliwoengoe was seized by which our troops again only meet little resistance. Hereby was the threat to the northwest gone. The following day the 1st R.S. made the last movement and seized Midjen and Tjangkiran. On 1st August the triangular Kaliwoengoe, Kendal and Weleri seized by 2-6 in cooperation with 1st R.S. and the Storm Unit. The sixth was stationed in Weleri. The inhabitants were very friendly and instead of running away they stayed and even helped with the clean up and moving of obstructions. In the meantime the Security Council started to be interested in the Indonesian question and on 3rd August the Lieutenant General Governor proclaimed that the action would end the following day at 24.00. For this last 24 hours there was still a few operations on the program. The security in the seized areas had to be guaranteed. It was first of all the W-Brigade, which moved forward along the coast on the mail road from Cherribon to Semarang. The Commanders of the W- and T-Brigade got orders to make sure they were in contact at the 4th August. In the darkness the 2-6 moved forward from Weleri with the destination “west”. It became a forced march. Although the 5th Engineer Field Company had used all the strength and power to bridge the Kali at Weleri. The road to the west from this place was totally blocked by hundred minor and bigger obstrocles. The djatiforest along the road had delivered the material for this. While the engineers cleared, helped by the population, the infantry moved forward kilometre after kilometre. At 3 o’clock in the afternoon contact was made at a place named Soebah. Here the troops from 2-6 and 2-4 shook hands: Semarang had yet again an overland connexion to West Java. The same day 1st R.S. ended the clearing up to the east with the seizing of Demak, Dempet and Goeboeg. 2-13 seized the outer area near Salitaga, which meant the water supply was secured again. The battalion had taken over the area from the 1st R.S. on 25th August. The surroundings of Ambarawa where occupied by 2-7 the same day. The town lay at the Rawa-Pening and it was very important that this hilly terrain, which dominates the valley, was in our hands. Beside this the deserted area Bandoengan , which ran out from Oengaran , which earlier had been visited by the Storm Unit and Soemowono which lay much higher. To the south Banjoebiroe, around 3 kilometres from Ambarawa at the food of Telemojo where the road start at the ocean, was seized. Hereby an area was obtained, which it was possible to defend. The reason for the weak opposition was that the republicans had given up the area already. The action was over before darkness fell. An American correspondent from A.P. who stayed overnight at the Concern Koffiepot, south of Bedono, was a bit naïve and very pleased that at 24.00 no more shoots where fired although a few hours before the republicans still fired mortar grenades. It was truce. The Brigade had reached all its goals within the calculated time. The casualties were few during the whole operation only two. The Tiger Brigade stayed outside Semarang. Where on the 4th and 5th August the W-Brigade had arrived and still had difficulties winning peoples popularity. The Tigers were still looked up to. In those days a Tiger Badge was a valuable thing since it made a recommendation for everyone in Semarang. Then started a period of hard work to free the occupied area for uneasy elements and make the population feel peace and security, which had also been the meaning of the whole action. In the beginning it had cost a lot of anxiety. The companies where stationed away from each other in a wide bow within which the population could feel secure. Already after a few weeks the results of this tactic could be seen. Oengaran, which had been deserted for months, got it population back. In Ambarawa the people were streaming back and Salitaga where the huts had been burnt down for the first fourteen days were inhabited again: The best guard of the particular property. It was only made possible by the marvellous work done by everyone. The troops ran their patrols and gave the opponent no rest and the intelligence service tried to track dangerous members down where ever they could. Beside this a no less contribution was given by the Red Cross, the first aid personnel and the troops who helped everywhere to everyone who needed. The Dutch was with this known from their best side. Everyone who needed protection and cloth could count on that everything was done to get it. Else the “stake of fire” was checked from the first day but still there were figures in our area that by night and darkness made sabotage….. there were no hate to this willing population and everywhere it was possible to establish a normal situation again with help from the military. The kitchens made enough food, the suppliers and doctors took the time and with the support of the troops reports where made about shortage of cloth and the T.B. got a lot of requests for cloth by people who needed it. In this way the Brigades area was again inhabited in a short time not with beggars. But with people who returned to their old homes and started to look after their fields again. And then started to support the government. When the Lieutenant General Governor proclaimed the borders at 29th August their where no need to redraw Dutch post. They where not put farther out except at one point by the occupation of Kopeng on the slope of Merbaboe. Because of this measure a hard pressure was taken away from the southern part of the Rawa pening. The results here were that the population returned and started to look after their fields. Everyone who has lived through these months in the first line in this area felt it was not a work of war but a work of peace they did. The battles mostly was about making sure infiltrators did not make harm to the troops and population. The Dutch post was never attacked. Instead the kampongs in the Dutch area had to suffer where murders and things like that was the order of the day. What this people had done wrong was not that they cooperated with us – This was actually only the civilian servants – but that they had returned to their homes in peace and security instead of living hunger in the Republican area. During a cleaning operation in November the T.N.I. made such a quick escape that it was easy for the Brigade to see that the border was unguarded. But shortly after this operation 600 inhabitants returned to Banjoebiroe from were they had fled during the police action. In this period they had got one rupiah in support the rest came from selling barang and begging. They returned from everywhere to their villages. Here they found area leaders the rice, which for them was so valuable. Thanks to all this the deserted district Oengaran in six weeks had 80000 inhabitants and Ambarawa’s population raised from 500 to 20000 in six weeks and Salatiga after few months had returned to its original amount of inhabitants except the Chinese. Everywhere in the area the markets reopened and their where a lively activity: Semarang too made a profit out of this when the food prices felt 50%. Unfortunately the opponents saw on this with mad eyes. He did everything to disturb the peace. In the first month’s mines were the biggest obstacles. These traitorous weapons could be meet everywhere. Because of this tactic, which was also against the “cease-fire”, the Brigade had a lot of casualties of dead and wounded. It took six weeks to bring this devil to his knees. Still the patrols continued to fulfil the task from the Lieutenant General Governor to bring law and order within the so-called “van-Mookline” laying area. In the third week of September a Battalion from the Brigade, which after leaving Semarang had four Battalions, 2-13 R.I. temporary send to West-Java to fulfil some special tasks in the area of the 3rd Infantry Brigade. Afterwards it returned to the Brigade. Changing between the 7th December Division and the W-Brigade it crossed through West-Java mostly on foot and “visited” among others Garoet, Darmaradja, Tjitjalengmka, Pameungpeuk. In some of those places they were the first visitors. They held the name from the Brigade high so this part of Java got a tremendous sound from the “Tentara Matjan ”. In the start of December they were stationed near Cherribon were they had to secure the pacification of a big area. Even a Company from 2-7 had to move to the area of Tegal and operate for a while. They returned after a month.